An exceptional tow car that appeals on just about every level. A class win at the Tow Car Awards is always an achievement, but for the BMW 520d Touring to win the 1700-1899kg class this year is truly exceptional. So many of this 2018’s best new cars fall into this weight category that any one of half a dozen new models would have made worthy winners. Why did the BMW beat them all? Because if you make a list of the attributes you’d want from a tow car, the 5 Series Touring has all of them. Stability is top of our list when assessing tow cars, and the BMW is unshakeable at speed. Data from the Al-Ko ATC sensors showed no movement from the caravan when slowing down from high speeds. Only in strong crosswinds at speeds that wouldn’t be wise (or legal) on the public road could we detect the slightest sway from the caravan. However aggressively we drove in the lane-change test, the 5 Series was unfazed. On the fastest run the caravan was starting to swing behind the car but the BMW swiftly pulled it straight again and was always under control. With xDrive four-wheel drive, there was never any trouble putting the BMW’s 295lb ft of torque to the road, even in the wet. In the hill-start test the combination of an electronic parking brake, a 4×4 automatic transmission and a strong engine made life easy for the driver. With or without a caravan, the 5 Series proved a pleasure to drive. It drives well in standard spec, but the optional adaptive dampers (£985) fitted to our test car are worth paying for. In ‘comfort’ mode the low speed ride is more supple than the regular suspension set up, and selecting ‘sport’ makes for flatter cornering and even tighter control of body movements. Inside, there’s plenty of space for the driver and passengers, and the boot is a healthy size – we found space for all but one item from our testing load of holiday luggage. Self-levelling suspension keeps the car’s attitude level even when heavily loaded, there’s a trailer stability system, and the reversing camera makes hitching up easy. And this is the first time BMW has taken the top prize at the Tow Car Awards. It may have been a while coming, but the 5 Series Touring’s overall victory is emphatic. Some years, it takes a long discussion to decide upon our overall winner. Others, it’s a very short conversation. In 2018, the choice was straightforward. 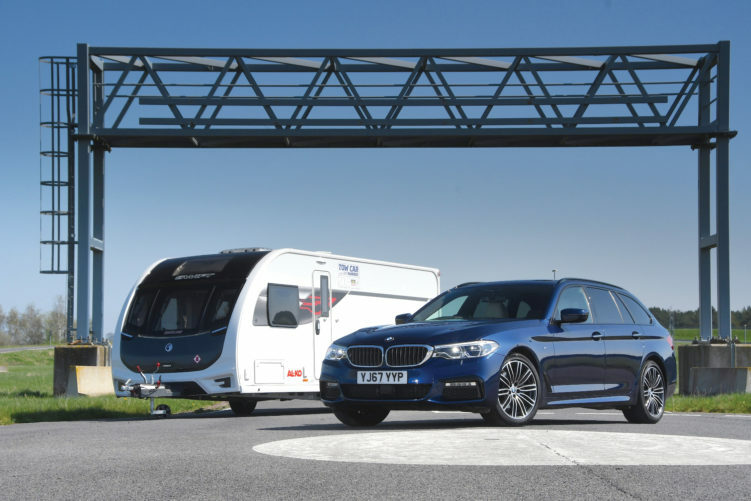 The 5 Series Touring is an excellent car, and in the specification we tested it’s close to perfect for towing. BMW’s xDrive 4×4 system means the car has good traction in all weathers, and the 520d’s 2.0-litre diesel strikes pretty much the ideal balance between price, performance and economy. Before it could even be in contention for the top award, the 5 Series had to win its class. That was easier said that done, given the extraordinary strength in depth of the 1700-1899kg category this year. But despite the excellence of cars like the Jaguar F-Pace and the Volvo XC40, the 520d was a clear winner. Clearly, this is a towing competition first and foremost and when it comes to pulling a caravan confidently and securely, the 5 Series has few peers. At high speeds it proved entirely unflustered, and it handled our most extreme emergency manoeuvres with calm composure. Every year, the lane-change sinks the hopes of many would-be contenders for the tow car crown, and 2018 was no exception. But the BMW made this challenging test of a car’s towing prowess seem easy. Even on the fastest of three attempts at the manoeuvre, with the caravan starting to slide behind it, the 5 Series held its line and refused to be pushed off course. There wasn’t a single one of our towing tests in which the BMW showed any weakness. The stopping distance from 30mph was short, and the hill start was effortless. If there’s a chink or frailty in the 5 Series’ performance we couldn’t find it. Our colleagues on What Car? have also tried and failed to find a serious flaw. In saloon form the 5 Series was What Car?‘s Car of the Year in 2017, and it’s one of the few cars to earn a coveted five-star overall score. It’s a comfortable and rewarding car to drive every day, and with so much space and such high build quality it’s almost as enjoyable for the passenger as the driver. Even our practicality testers – notoriously hard to please – were happy with the car’s generous luggage space and comprehensive list of towing friendly features. So, a first overall win for BMW. If future models live up to the benchmark set by the 5 Series Touring, it won’t be the last.